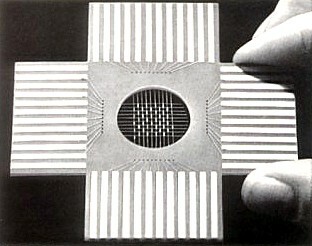 Twistor Magnetic Memory, similar to Magnetic Core Memory, was a new form of computer memory invented by Andrew Bobeck at Bell Labs in 1957. Twistor Memory technology used a grid of very thin magnetic wires interwoven with copper wires that conducted electrical current. Each intersection of the grid represented one bit of computer memory. 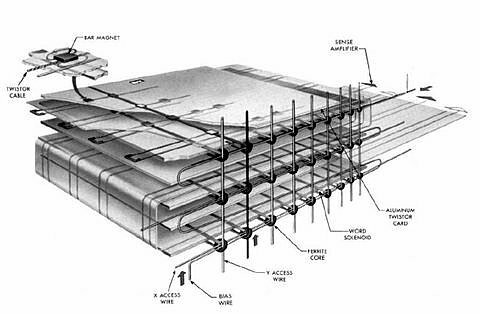 Bell Labs praised the new Twistor technology as being superior to magnetic ferrite core memory - it required less current, weighed less, was denser, and was cheaper to manufacturer. Twistor Memory was used from 1968 to the mid 1970's mainly by Bell Telephone for use in their ESS Telephone switching system. Twistor memory would never catch on commercially. By the 1970's, Twistor and other magnetic memory technologies would become obsolete due to the introduction of Semiconductor Memories. Development of Twistor Memory by Bell Labs would later lead to another short lived magnetic memory technology in the 1980's know as Bubble Memory.